Co-authored by Elizabeth DeBold (Curatorial Assistant), Renate Mesmer (Head of Conservation), Austin Plann Curley (Book Conservator), and Adrienne Bell (Book Conservator). With special thanks to Kevin Cilurzo (Conservation Intern). As some of our respondents observed in their comments on this month’s Crocodile Post, there is a strange-looking deposit on the leather of this book. 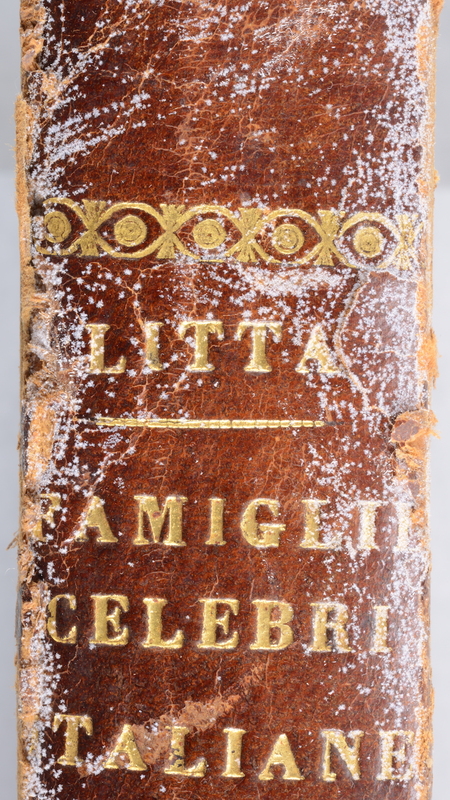 The book is, as others correctly identified, one of the volumes from the Folger’s multi-volume set of Famiglie celebri Italiane…, an eighteenth-century work published in Torino, which focuses on Italian heraldry. 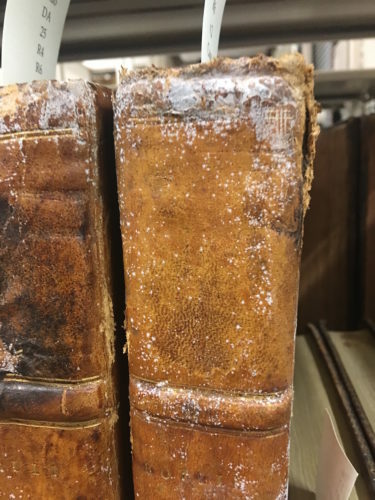 Recently, one of our curators noticed that several volumes in our vault had developed a strange, white deposit, and reasonably assumed it was mold. Following our protocol for finding potential mold, we prepared to seal the affected volumes in plastic, and contacted our conservators. All while trying not to panic. “Mold” is one of those words that strikes fear into the hearts of every librarian. Only a handful of volumes in our collection are currently showing evidence of spew, possibly because we recently lowered our vault temperature by 10 degrees as part of a grant-funded preservation project. Low temperatures extend the life of different materials significantly, including paper, wood, and leather. 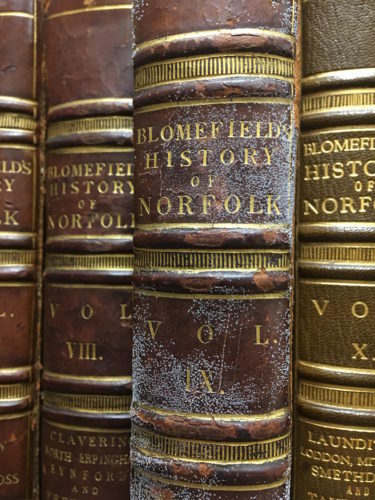 Francis Blomefield’s Essay towards a topographical history of the county of Norfolk (Folio DA670.N6 B6 Cage). Photo by Elizabeth DeBold. Rotuli scotiae (Great Britain. Record Commission. ), (DA25 .R4 R6 Cage) Photo by Elizabeth DeBold. 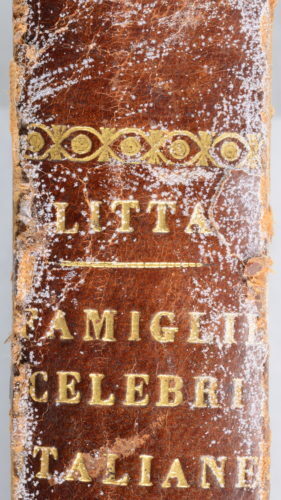 The volumes of Famiglie celebri Italiane are bound in similar leathers, but the skins might not all be produced identically. Another reason for this phenomenon could be due to dressing the leather, which was a common practice into the late 20th century, including at the Folger. We don’t have any treatment records for the volumes affected with spew, don’t know if they were ever treated here, and if they were, whether that treatment included dressing the leather. Of course, our library staff knows (and you should as well) to never assume—if you see something strange and are unsure of what it might be, always take steps to confirm its identity so that you know how to proceed with proper treatment, if necessary. In the case of the spew here at Folger, our conservators will carefully wipe it off with a soft cloth to avoid removing any leather. The Alaska State Museum. “Leather and Skin.” What’s that White Stuff? Caring for Alaskan artifacts (blog). McLean, William. “Leather ‘Bloom’ – Causes and Remedies.” Skin Deep: the biannual Newsletter from J. Hewit & Sons Ltd, no. 2 (1996): 19-20. North Carolina Department of Cultural Resources. “Less is Usually More.” North Carolina Connecting to Collections (blog). It’s a safe bet that all of the books shown in the photos received regular doses of leather dressing, since that was once part of routine maintenance at the Folger, and none of them were acquired recently. Both the “British Museum formula” (lanolin, vaseline, beeswax, and cedarwood oil) and the “Newberry Library treatment” (neatsfoot oil and lanolin) were used at the Folger. According to a memo about “cleaning and greasing the books” from 1968, it took “about five years to go over the whole collection, by which time it needs it again.” I don’t know how long the practice went on, but it was one of the duties in a Folger job advertisement from 1976, so it was at least into the 1970s. Why was the practice of leather dressing discontinued ? Some leather in old books is disintegrating because it is so dry. To summarize, leather dressing has been found to be more harmful to leather bindings (and other historic leather objects) than helpful. We’re definitely still invested in preserving the condition of our leather bindings, and our conservators have a few different treatments they use to work on leather–for example, for books affected with red rot, they have a treatment process that consolidates the rot and prevents it from spreading. Of course, the old adage that says “an ounce of prevention is worth a pound of cure” is true–the first, best “treatment” is preventing (or at least slowing) the kind of damage you describe in the first place: careful handling, a stable climate, and (sometimes) protective enclosures all help keep our collections in the best shape possible. Thank you for your very helpful reply. What treatment do your conservators use for red rot ? I believe they use a solution of Klucel G for many of the books experiencing red rot. Perhaps, since you’re asking, you have an item or items you’re interested in treating–in which case, we can’t be sure Klucel G would be the best treatment! Speaking entirely without knowledge of your affiliation or your level of expertise, I would definitely recommend consulting with a conservation professional before taking any treatment steps. NEDCC, the Northeast Document Conservation Center, offers some excellent resources: https://www.nedcc.org/.